2) Call Us - 01622 891791 - between the hours of 9am to 9pm, 7 days a week, have your details ready and we will process your vouchers straight away. Note: call us if you want to book in on a specific date. Have your Gift Voucher sent in a beautiful 'Balloon in a Box'. For £15 including p&p we will send your vouchers out in a box containing a helium balloon and a personal message of your choice. Qty. 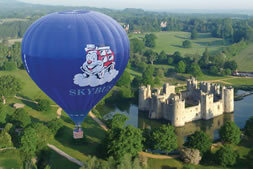 Morning Balloon Flight Vouchers' - £130.00 per person. Spring Deal (Fly early on a Mon/Tues or Wed morning only £130.00). *Provide name(s) to go on voucher(s) here. Qty. Fly Anytime - £140.00 'Anytime Flight' voucher valid for 12 months (morning or evening including weekends) (Fly any Morning or Evening including weekends). Qty. Balloon in a Box - £15.00 (Gift Wrap Your Voucher(s)). *Provide message and DATE OF DELIVERY. We fly from several sites in both Kent and East Sussex. We are the only company based at Headcorn Airfield which is our primary site, a must for aviation enthusiasts who can see skydiving, helicopters, Tiger Moths and stunt planes. With a museum, bar and café it is situated a 10 min drive from Leeds Castle, Junction 8 off the M20. Headcorn railway station is only 5 minutes away and given notice, we can arrange to pick you up. We also fly from the lovely ‘London Beach Hotel & Spa’ based in Tenterden, where you might consider extending your stay to enjoy the excellent facilities available such as the golf course, state of the art health spa or the wonderful menu in the restaurant. Please phone us to discuss other launch sites near Paddock Wood and in East Sussex.